The Cardiomedics model CardiAssist 4500 was the third model ECP device introduced by Cardiomedics Inc. The CardiAssist 4500 is a technological improvement of the previous generation CardiAssist 3000 & 4000 models. The 4500 continues with the same ‘portable” ECP configuration with significant technological upgrades. The 4500 has a larger touch screen monitor, updated windows operating system, EMR compatibility, improved reporting (full disclosure), and component serviceability. 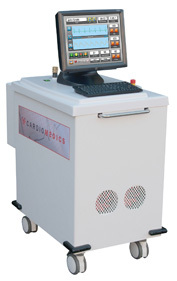 We rate the CardiAssist 4500 ( and all models from Cardiomedics) the highest in the industry for its smallest footprint. The recommended (optional with purchase) is a message table platform is much improved for patient comfort than previous generation units. This system is operating on a windows 7 operating system platform with a 17″ touch screen monitor. The unit has finally upgraded to include EMR integration capability. System has improved system reporting capabilities similar to the ACS NCP Series devices by including minute by minute reporting capabilities or “full disclosure” This capability is arguably a patent infringement on the ACS “Automatic Treatment Report” because ACS owns the patents to reporting full disclosure and calculating Peak-Peak rations on screen. Cardiomedics improved the cuffs with softer more durable material. Although improved over previous generations, the CardiAssist is still not the quietest device in the market. More reliable, but still not the work horse like the Vasomdical TS-3 or ACS NCP Plus. Perhaps the newest concept to the ECP device technology is their component serve concept. The device has components that can be swapped rather than calling out a service tech. Good concept, but not proven yet. Cardiomedics has a rough reputation for service & support. Cardiomedics 4500 can be purchased for $35,000 or so new. There are so few in the market that we have not yet seen a used model for resale.